Iron and Wine played to a sold out show at the Wiltern on Tuesday night supporting the release of the band’s newest album,Kiss Each Other Clean, released on the same day (1/25/11). 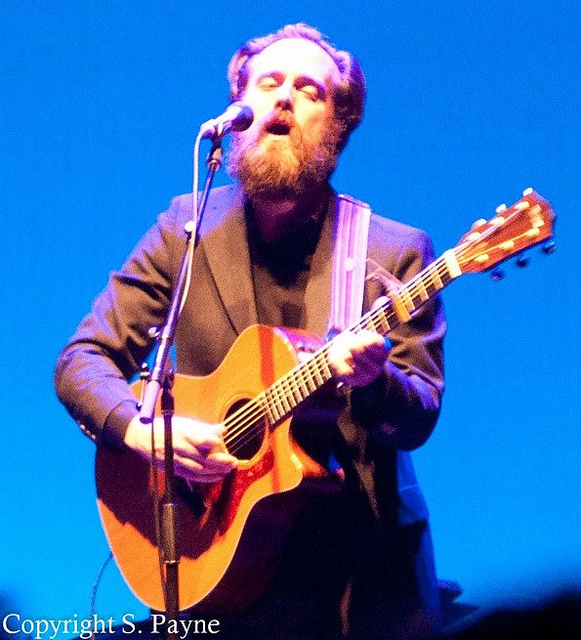 “Let’s see what happens” was repeatedly suggested to the audience by Samuel Beam, the man behind Iron and Wine, as he casually introduced his new work. It would appear that Beam’s intent was to slowly transition his fans into the jazzy-but-still-somehow-folk style of his newest release, based on the small number of new songs played in the set. Midway through the night, Beam was joined by a stage full of musicians, including Jim Becker and Ben Massarella (Califone andÂ Red Red Meat), Stuart Bogie (Antibalas,Â TV on the Radio,Â Yeah Yeah Yeahs), as well as back-up singers Rosie Thomas and Academy Award Winner Marketa Irglova (Once,The Swell Season). As would be expected at a folk-rock show, the night was sedate and intimate, giving the crowd the opportunity to experience the sincerity and truly artistic qualities of Beam’s music. His fans seemed to love the new songs and the newly arranged favorites, including a dancier version of “Boy with a Coin.” By the end of the night, it was clear that the “Glad Man Singing” songs about heartache, death, and political confusion truly loves the music he has created and appreciates the opportunity to let it be heard.